New Delhi : It is known to all that refrigerator is the best place to store fruits, vegetables and other food items. But, are you sure that the fridge protects all kinds of food available around you? Actually Not! 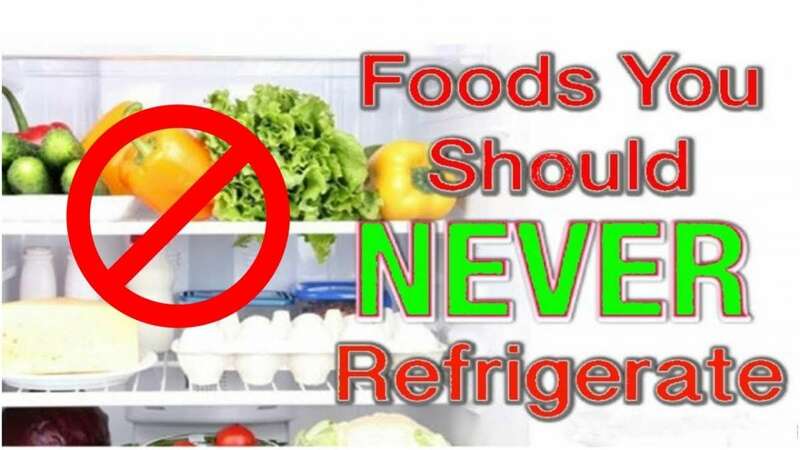 There are certain vegetables, fruits and solid food products which should never be kept inside the fridge. Talking to a city nutritionist we have come up with the list of 10 foods you should not store in cold temperature. Tomato is the fruit that grows in the sun. In scientific terms, tomato is not a vegetable but it is fruit and it requires a lot of water and sunlight. When the weather cools down, it does not grow properly. Therefore in the fridge it tends to melts and gets rotten soon. Banana gets dark if you keep in the fridge. Ethylene gas gets out of its stem, which affects the fruits too quickly. To avoid this, you can use plastics on the banana stalks. As a result banana and the fruits kept around it stay fresh for a long time. If you want to keep the apple in the fridge then wrap it in paper and put it in the shelf made for the fruit vegetable. Do not keep seed fruits like peaches, plums and cherries in the fridge. In low temperatures, enzymes present in them become active and the fruit gets rotten fast. Fruits containing citric acid, such as lemon and oranges should not be kept in cooling temperature as they cannot tolerate the coolness. The scales begin to appear on their peels and they don’t taste natural. The juice of these fruit starts drying up in the fridge. People like to eat cold cucumber during the summer season. But keeping them for two or three days will make them watery. Always keep them out and separate from ethylene gas leftover bananas and tomatoes. It is advisable that for all these fruits, a rack can be kept in the kitchen. You can keep different fruits on each shelf so that they do not hurt each other. After cutting, the watermelon and melon we keep them in the refrigerator, but do not do so from now onwards. These fruits contain heavy amounts of antioxidants which can worsen if kept in the fridge. Keep cucumber, watermelon and melon in the fridge for a few minutes for cooling. Potato starch turns into sugar by keeping it in the fridge and it has an effect on its taste. Potatoes should be kept away from the sun. For this, find a cool place in the house and take it out of the plastic bag so that potatoes can breathe. 45 degree temperature is best for storing potatoes. Many people think that the reason for keeping the onions away from the fridge is only their smell. Actually, onions like potato get damaged by moisture. Onion gets dry in the fridge. It is best to store onion in a dry and dark place like potato, but do not keep it with potatoes. The gas from the potato spoils the onion. Do not put garlic in the fridge just like onions. This will germinate and loosen. Garlic and onion can be put together. Just keep in mind that they do not require sunlight or too much light. Be sure to eat bread within two or three days. But if you want to handle pizza breads, burger breads, then keep them in the freezer, not in the refrigerator. Keeping bread inside the fridge dry them up. Before eating, remove it from the freezer and keep it out for a while and then toast.